The majority of cars will only have 1 cigarette lighter socket at the front of the car. This can be a problem when multiple electric devices require electrical charge. The best cigarette lighter splitter is the BESTEK 3-Socket 200W 12V/24V DC that has 3 sockets and 4 USB ports that are protected by a built-in 10A fuse and protective circuits to prevent overheating or overcharging. Due to the low cost of the cigarette lighter adapters, many manufacturers try to reduce costs further by lacking protection without fuses. Always ensure there is a fuse and other safety features presents before using the device inside of your car. Its important to check your car can support the current draw, which shouldn’t be a problem for the majority of cars. If you drive a classic car, it would probably be best not to use a splitter running 3 or more sockets powering up electrical devices. The amount of driving aids, comforting products and personal belongings that need charging is increasing daily. The majority of drivers would benefit from owning a cigarette splitter for long journeys and travelling with other passengers. Safety, performance and the number of sockets should be the features you consider before purchasing. Below is a list of the best cigarette lighter splitters for your car that include 12V/24V sockets and USB ports. Available in both red/black and grey/black, the Bestek is a premium cigarette lighter splitter, which includes 3 12V/24V sockets and 4 USB ports. The USB ports output 6A each to charge 4 devices at the same time. The three 12V/24V cigarette lighter sockets output a total of 200 watts that will power a wide array of electrical devices. There is a built in 10A fuse to prevent overheating and overcharging to abide by high safety standards. In terms of the features aside of safety, there is a digital LED display, power switch, smooth plastic design, 2.6 foot extension cord and more. Bestek have really pushed the boat out and it is the best cigarette lighter splitter you can buy. Safety and performance achieve top marks and its built to last unlike many other cheaper units. 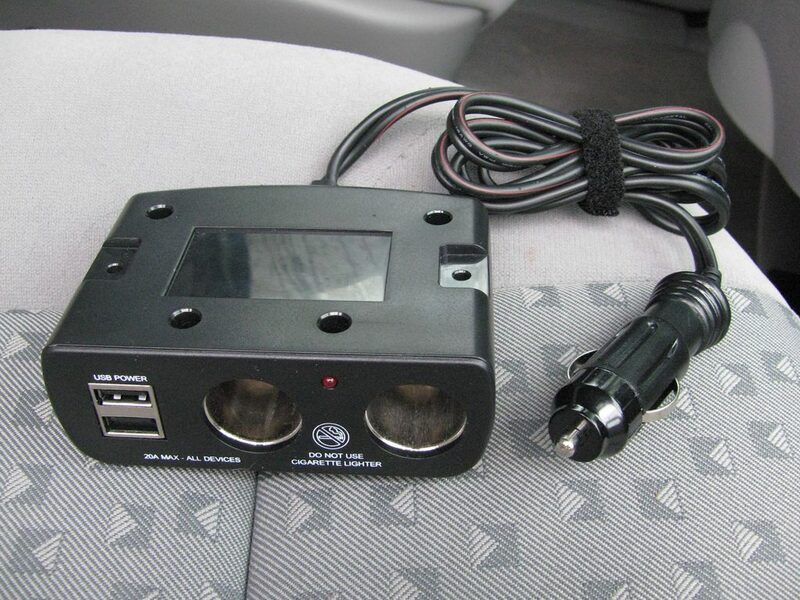 For drivers looking for a smaller cigarette lighter splitter, the Lihan offers two 12V/24V sockets and two USB ports. All 4 sockets will work simultaneously and the digital display located on the top of the unit will display the voltage and current. A unique selling point of this adapter are the individual on/off switches. This reduces the need of pulling in and out the chargers that induces wear and tear on both the chargers and adapter. The current and voltage display provides instant feedback to the driver of the health of charging. The device itself has a clever circuit that cools down when it detects overheating, over current or over voltage behavior. Overall, it is the best cigarette lighter splitter with on/off switches and the design is very compact so its not “in your face”. The Otium is a direct competitor to the Bestek unit, with 4 USB ports and 3 sockets for charging electrical devices. It is also cheaper than the Bestek device, which will be more appealing to other drivers. To ensure your cars battery is not under any strain, there is a LED display that indicates the voltage but also flashes when voltage drops below 10.5. The circuit is certified by RoHS, CE & FCC and ensure it does not suffer from over-temperature, over current, over voltage and overload malfunctions. Overall, the Otium offers great value for money with a large number of sockets and USB ports. The design is simple and compact so that its not obtrusive within the car. It is one of the best cigarette lighter adapters for the money and features everything you would need. Many people are not bothered with the cigarette lighter sockets but simply want to split the socket into USB ports. The majority of charging devices such as GPS units and smartphone chargers uses a USB, meaning you will have to get a separate cigarette lighter charger in order to charge the device. Each of the USB ports are 2.4A, which is required for high speed charging. Both ports can be used simultaneously with no power surges and it comes with 1 years warranty. Overall, the Maxboost is the best cigarette lighter USB adapter you can buy. It excels in performance, durability and value for money, which makes it highly recommended. Splitting into sockets and USB is pointless if you only want USB ports and the Maxboost does exactly that. The Vano splits the cigarette lighter socket into three USB ports where one is a 1A and the other two are 2.1A. For charging smartphones quickly, you will want to use the 2.1 high speed ports and where its not required i.e. dash cam or GPS, you can use the 1A to reduce the current load. The design is rugged and the Vano comes with a year guarantee for peace of mind. It is CE, ROHS, FCC and ISO9001 certified and has protection against over-charging, over-voltage, over-heating, and short circuits. Overall, the Vano is a worthy contender for best USB cigarette lighter adapter with 3 ports and excellent build quality. As technology has improved and there are more electronic device available, the need to charge whilst driving has increased. For example, due to the budget dash cam craze, a large amount of people charge whilst driving, leaving no other cigarette socket available for other devices. Having to switch between the 12V/24V sockets all the time will cause additional wear and tear. Highly rated cigarette lighter splitters that contain additional sockets and USB have come along way and have become much safer. Below are some considerations you should take before going for a certain cigarette lighter adapter. Choosing a certain style of adapter can be tricky because there are so many different types. For example, some may just have additional sockets, some may have both sockets and USB ports whereas other will be complete with just USB ports. You should ask yourself what charging ports you require and how many in total. Of course, more the better but if you are only using sockets or just USBs, there is no need for the additions if you will not use them. For example, if you have headrest DVD players that use sockets, its vital that the adapter can handle the current draw. On the flipside, the majority of smartphones use a USB port for fast charging. If the cigarette lighter splitter only has sockets, you will need to purchase a USB to 12V/24v adapter in order to charge your phone. Sadly, there are so many cheap knock off splitters available that have poor wiring and some without fuses. This is simply asking for trouble and won’t last a few months. It is always advised to go with a more expensive cigarette lighter adapter that includes a range of safety features. Look out for CE, ROHS, FCC and ISO9001 certification as well as Surge protection, USB intelligent identification, Overload protection, Over voltage protection, Over current protection and Short circuit protection. If you are concerned with how the splitter is working, you will be able to test with a multimeter designed for cars that provides feedback of the voltage passing through. If it is dropping below 10.5 or operating at high voltage, avoid using it and contact the manufacturer. There are two distinctive designs to choose from that include fixed into the cigarette lighter socket or ones that use a power cord. Fixed cigarette lighter splitters are more compact, flow with the design of the car but have less sockets or USB ports. Some fixed units will have rotation on the connector for movement in order to fit properly without being in the way. Units that have a power cord can extend to reach the back seat passengers which is a huge bonus. However, they will need to be secured down or kept in a area that wont allow it to be thrown around whilst driving. They are often much larger and provide more additional sockets or USB’s. All of the highly rated cigarette lighter splitters above are safe units to use with a range of different sockets and USB’s. Before purchasing, ensure you will have the correct number of 12V/24V sockets and USB ports. We strongly recommend that you avoid the cheap models as you may damage your own charger or blow the cigarette lighter fuse itself.